Joan Aitken, Traffic Commissioner (TC) for Scotland, has imposed a £10,000 financial penalty on Stagecoach in the Highlands following an incident in which a Stagecoach vehicle lost a wheel in Caithness. Stagecoach buses in Sunderland have started accepting payment from ‘Pop’ Pay As You Go smartcards for travel in the city. Stagecoach has joined forces with the Freight Transport Association (FTA) to develop a bespoke training course designed to further improve safety standards and vehicle reliability. Almost half of Oxfordshire’s subsidised bus routes could be scrapped following the end of council funding. A seasonal promotion, launched this June by Stagecoach East Midlands, offers Hull residents the opportunity to visit the city centre at a reduced cost in the evening. 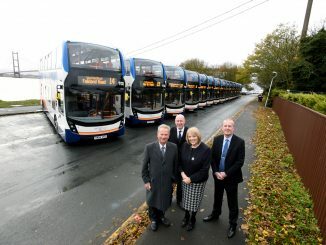 Stagecoach East Scotland’s open top bus service at St Andrews has stopped running, the Fife Herald reported.